Using a Sprouter your harvest is ready in just under a week. A Sprouter is a kitchen tool that has been used to grow seeds into nutritious sprouts and mini vegetables with minimal care. Sprouts are highly nutritious and can be used for sandwiches, juices, smoothies, salads and even desserts. Sprouters are designed to hold a certain amount of seeds, They have drainage holes which aid in growing sprouts. Place the required amount of seeds at the bottom of the sprouting tray or sprouting jar, water and rinse the seeds as per the instructions. Since the Sprouters have drainage holes, the water will seep right through and just leave enough moisture for the sprouts to grow. The bottom tray does not have the drainage holes, it collects the water which you then throw out. Once the sprouts are ready, you simply remove them from your Sprouter and serve them the way you want. Wash your Sprouter and start the sprouting process again or dry and store your Sprouter until you are ready to use it again. This type of Sprouter is supplied with more than one tray that you can stack on top of each other and spread your seeds across. Each tray normally has drainage holes at the bottom of the tray to allow water that rinses the sprouts to drain off freely. The bottom tray does not have the drainage holes, it collects the water which you then throw out. 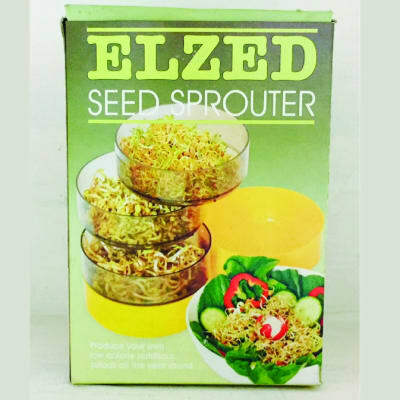 This type of Sprouter allows you to make the most economical use of space while giving you the option to grow different types of sprouts at once. For the best results when sprouting, keep your Sprouter in a cool dry place.